There are so many references to George Washington today -- numerous myths, legends, anecdotes. Now find out the truth behind the perception. 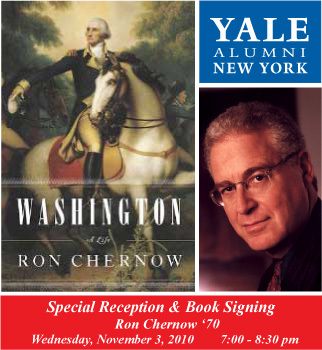 Meet celebrated author and acclaimed historian Ron Chernow '70 at a special reception and book signing for his new work,� Washington, A Life, which has just been released to spectacular reviews (New York Times, Wall Street Journal, Booklist). Ron's work brings to life George Washington, the legend, the man, the general and the President. Washington, A Life is a 923-page masterpiece, with a cover price of $40. We are pleased to offer special pricing of $40 for the book AND the event. Please note, there are only a few�seats left for this event, so secure your tickets soon, before they sell out! It's very fitting that the event will be held on November 3, one day after the midterm elections.��Ron has written extensively comparing the political climate created by our founding fathers to the present political situation:� "The Founding Fathers vs the Tea Party" (NY Times Op-Ed, 9/23/10), and "The Feuding Fathers" (Wall Street Journal, 6/26/10). An honors graduate of Yale and Cambridge, Ron Chernow is one of the most distinguished commentators on politics, business, and finance in America today. The St. Louis Post-Dispatch has hailed him as one of the preeminent biographers of his generation and Fortune magazine has dubbed him Americas best business biographer. Tenaciously researched...This new portrait offers a fresh sense of what a groundbreaking role Washington played, not only in physically embodying his new nation's leadership but also in interpreting how its newly articulated constitutional principles would be applied...deeply rewarding." This event is sponsored by the Yale Alumni Association of Metro New York's Development Committee and Educational Programs Committee. All profits from this event will benefit the active programming of the Yale Alumni Association.